When Milo joined the RainyDayCrew he was just a peanut of kitten. He was so small that getting up the stairs was an event onto itself and required a nap afterwards to recover. However, Milo did come up to speed quickly and was contributing to the team by the end of the month. 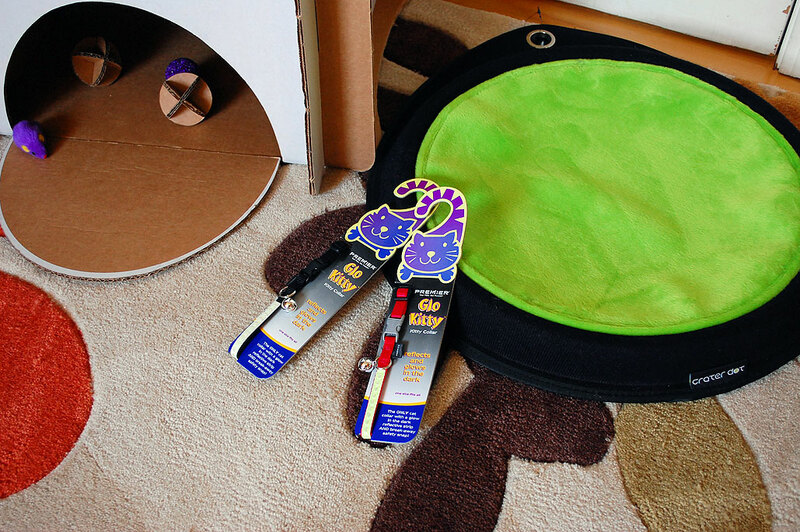 Eliot and Milo have both been key testers of various innovative feline-focused products (LitterRobot, SleepyPod, CraterDots, CatCaboodle, etc…). Now that Milo is almost a year old, he is venturing outside to patrol the RainyDayGarden grounds with Eliot. To ensure the safety of all of the woodland creatures, we needed to get Milo, like Eliot, a bell to announce his presence. After checking around, we came upon a product called GloKitty. The GloKitty collar is “the ONLY cat callar with a glow in the dark reflective strip AND break-away safety snap.” It also has a nice shiny bell that will jingle when Milo goes on the run. The strip glows after exposure to sunlight. We are not sure how long the glow lasts, but the material is also reflective so it will show up regardless. Some break-away collars have a stretchy rubber band that snaps when over stretched. The GloKitty uses a re-attachable buckle. The buckle makes it easy to put the collar on the cat and to put the collar on the cat again when it comes apart (assuming you can find it). Milo has never worn a collar before, but he did not seem to mind the GloKitty at all. He has worn one for about two weeks now. The collar came off once because we made it too loose. We tightened it up, but he still managed to lose it outside (yet to be found). This is actually a good thing as even though the collar didn’t make it home, Milo did. We put on a new one and made it a bit tighter (one finger fits easily underneath). Hopefully, this time we got it right.